All that Larkin Pace wants is a new camcorder, so he can become the next great filmmaker. But he’s too young for a real job, his parents won’t give him money, his older sister exists just to make him miserable, and his arch-enemy Dalton Cooke is trying to steal his girlfriend, who might just not be his girlfriend after all. 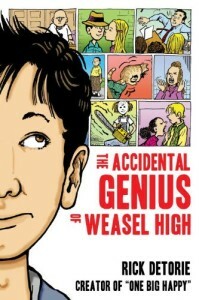 Kids who liked the Diary of a Wimpy Kid books will probably enjoy this book. In fact, the back cover even says “A book for the wimpy kid who has grown into a wimpy teen.” Kids who liked Diary of a Wimpy Kid but outgrew them, who want a book with more story, however, will be disappointed. To be certain, it’s not the worst book I’ve ever read; in fact, there were large parts that I enjoyed. It’s just not as great a book as it could be. But it makes a nice break between heavier, more serious works. Perhaps because they are both diaries, they also share a highly episodic nature. 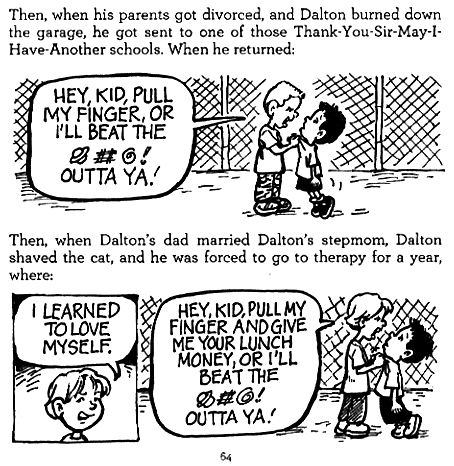 To be sure, there is a bit of a narrative arc from beginning to end, and that narrative arc is more strongly pronounced in Accidental Genius than in Wimpy Kid, but just barely. This may in fact be part of the appeal of these books, especially for reluctant or struggling readers: if you lose your place, or set the book down for days at a time, it really doesn’t matter. You don’t need to remember and integrate a lot of details from your previous reading to make sense of what you’re reading right now. The illustrations are actually far better than those in Wimpy Kid, whose illustrations are overly-simplified to the point of insulting a reader’s intelligence. The illustrations in Accidental Genius are not cookie-cutter illustrations; they have a sense of artistic workmanship and creativity that add to significantly to the quality of the book. In that respect, it shares something with Sherman Alexie’s Absolutely True Diary of a Part-Time Indian (along with an amazingly similar title, which is probably a happy accident). That’s about as far as the comparison can go, however. The characters are fairly static, and in both its title and content, it mythologizes childhood in a way that Absolutely True Diary never does. Part of that mythologization can be found in actual name of Larkin’s high school—Weatzle High—which the Foreword tells us is “commonly known as Weasel High” (9). Like the backward letters on children’s clubhouses, and like the clubhouses themselves, I have never known kids to mangle the name of their school, and for a simple reason: no matter how much they may dislike it, they simply aren’t engaged enough to bother. Larkin’s family lives on a farm that isn’t quite a farm, but includes a menagerie of “sixteen dogs (all named Buddy because many of them came without names, but they all answer to Buddy)…[a] turkey, nine cats, five rabbits, seven hamsters, and Troy and Vanessa, the potbellied pigs” (18). For animal-loving kids whose parents won’t allow them to have a pet, this is a wish-fulfillment fantasy writ large. The largest weakness of the book is that Detorie cares perhaps too much about Larkin and is overprotective of him. Larkin is occasionally banged around a bit, but he is never so damaged as to become really interesting (as Arnold Spirit is in Absolutely True Diary of a Part-Time Indian and as Tom Filber is in David Klass’s Stuck on Earth). At every step there is a concerned adult who steps in to aid and protect him, and so he is never allowed to experience real failure and so never experience real success either. He eventually finds a way to earn the money for a new camcorder, but it is through no pluck or fearless endeavor of his own that he pulls it off. In fact, one feels the deus ex machina clunking along pretty loudly here. Some might argue that allowing Larkin to be truly hurt would introduce a dark tone to the book that would detract from its upbeat cheerfulness, but as long as that experience is not gratuitous—that is, it moves the story along, and is not included just to get a PG rating—then it would enhance those parts of the story that truly are happy. Larkin’s victories would be that much more significant because he would have earned them, rather than paying for them with his dad’s debit card. If anything, Accidental Genius comes across as a book which is trying to be as realistic as possible without risking a censorship issue. 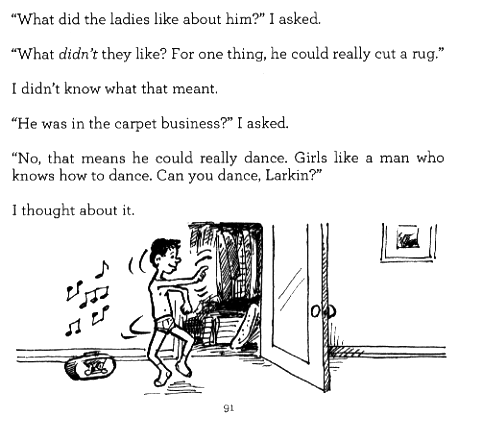 Although there are two images of Larkin in his underpants (see above for an example) and one of his bare bottom, the style is stylized enough not to offend the vast majority of people in this country, nor is there an instance of any sort of salacious, drug-related, or violent behavior, other than a bit of mild bullying. Larkin is actually an expert at Doing The Right Thing, and one senses the heavy hand of the hidden adult in Larkin’s actions. Like I said, this is not a bad book, but it is hardly a challenging one. Take it on vacation, or a long car or plane ride. Just don’t expect anything deep or life-changing to come out of it. *Many people continue to believe these books are true, although they are not. Snopes.com has a good article about them here. Detorie, Rick. The Accidental Genius of Weasel High. New York: Egmont, 2011. Print.